The eternal world plan applies to large as well as to small beings. The physical universe is built up with life within life, upwards and downwards into infinity. Everything is well fitted together as cogwheels in the works of a clock. All living beings have, just as God, an eternal I, which survives every created thing. As we are immortal, we can take advantage of all our experiences, life after life. All experiences show themselves, in the final reckoning, to be useful and beneficial for all and everyone. The divine plan of creation unfolds itself as completely loving, logical and methodical. This is explained through this cosmic symbol named: "The eternal world picture – the living being II, the eternal Godhead and the eternal sons of God" – Symbol No. 11. 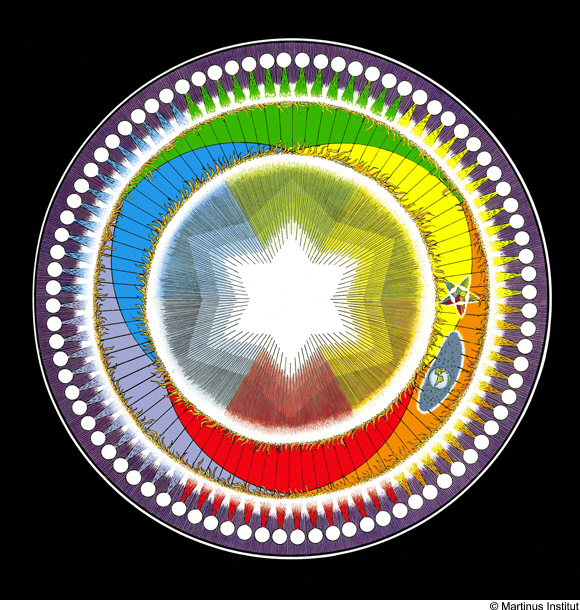 This eternal experience happens via 6 principles of existence – the plant kingdom (the red colour on the symbol), the animal kingdom (orange), the true human kingdom (yellow), the kingdom of wisdom (green), the divine world (blue) and the kingdom of bliss (light indigo). Here occurs life’s eternal interaction between God (the white star and the radiating field) and the sons of God (the outermost circle). It is our satiation with the light and desire for contrast which leads us from the all-loving light zones to the physical world. In the plant kingdom begins the adaptation to life in the sphere of the killing principle. The consciousness here goes through its most primitive phase having only the ability to faintly sense the difference between pleasant and unpleasant. The terrestrial human being is still partly an animal and lives therefore still to a high degree under the animal conditions of life – might is right. Even though the humane world religions for thousands of years have stimulated human beings away from the use of the killing principle, the humane ability is still of a far younger date in evolution. It requires time to develop from selfishness and the survival instinct to the opposite – the loving, forgiving disposition. But the process occurs automatically as ”we reap what we sow”. The moral of killing leads to suffering for us ourselves which creates a longing after the contrast, the humane. With time arises a susceptibility for the ideal of universal love and for an intellectual explanation. Martinus own explanation of the symbol is to be found in his book "The eternal world picture 1". The cosmic symbols of Martinus are copyright protected by Martinus Institut 1981.